Increasingly, it appears that in a rerun of late 2014, OPEC has lost control of the oil market. As a reminder, it was Russia together with Saudi Arabia, that recently helped lead the push for the OPEC+ group to curb output restraints that had been put into place since the end of 2017. 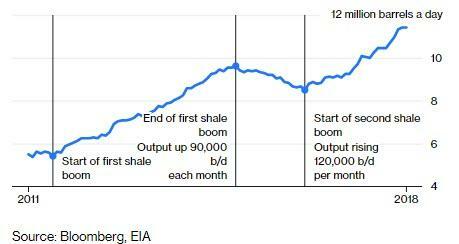 Ironically, both countries raised production to near record levels at the same time that US output soared as a result of companies in the Permian Basin finally being able to transport oil to the Gulf Coast (if not nearly all of it as many more pipelines are needed). These combined increases have changed the market sentiment from worries about a supply shortage to very real concerns about a glut. The sentiment changes happened over the course of the last three months, as oil prices have tumbled from almost $90 a barrel to now under $70 a barrel in short order. And as the scramble to offset declining prices with higher oil has re-emerged, with Saudi Arabia last week abandoning OPEC production curbs for the first time since the 2016 Vienna deal, developed nations oil stockpiles have resumed rising again and are expected to rise above their five-year average level once October data is finalized and released. At the same time as prices have moved lower, Saudi Arabia stated it would cut exports by 500,000 barrels a day. They also warned producers that they need to cut about 1 million barrels a day from October levels. The response from Putin and Trump to the suggestion was lukewarm at best and unceremonious at worst. 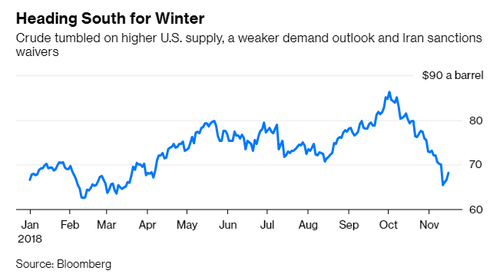 Bin Salman – at least for the time being – needs revenue from oil to help continue his "transformation" of Saudi Arabia: the IMF has forecasted that Saudi Arabia needs an oil price of $73.30 a barrel next year in order to hit its budget but right now Brent is trading about $5 below that level. Output cuts seem to be the only way MBS can realize the price that he needs. On top of that, he will face challenges from both Trump and Putin. Neither leader is excited about restricting their respective countries' production. Because Moscow’s budget is far less dependent on oil prices now than it was in 2016, Putin may decide that his relationship with MBS could be worth the sacrifice. However, it is anything but a guarantee at this point. Putin has publicly said that he would like oil prices around $70 a barrel also. President Trump is likely to be more vocal in his opposition to production cuts. It'll come at a time when he and MBS are trying to hang onto what’s left of their political relationship in the midst of considering sanctions on Saudi Arabia as a result of the war in Yemen and the murder of journalist Jamal Khashoggi; meanwhile US consumers demand cheap gas. But like in 2014, the biggest threat to Saudi Arabia is the Texas oil patch. Producers in America have added significant volume over the last 12 months. In fact, just the added output this year is equivalent to the entire output of OPEC‘s Nigeria. The production from American producers could reach 12 million barrels a day by April, according to the Department of Energy. 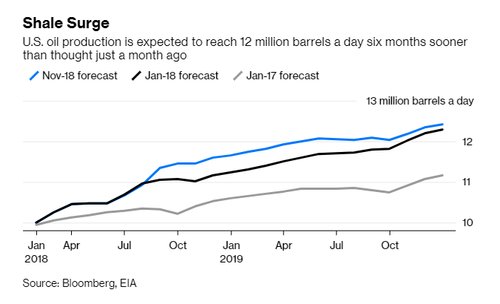 That is six months sooner than it was forecasting a month ago, and 1.2 million barrels a day more than estimated back in January. And then there is the political risk. President Trump stated in his Sunday morning interview with Chris Wallace that he has been briefed on an audio recording of the Jamal Khashoggi slaying, but that he was advised not to listen to the "suffering tape." "Because it’s a suffering tape, it’s a terrible tape. I’ve been fully briefed on it, there’s no reason for me to hear it," adding "I know everything that went on in the tape without having to hear it." "You saw we put on very heavy sanctions, massive sanctions on a large group of people from Saudi Arabia," Trump said. "But at the same time we do have an ally and I want to stick with an ally that in many ways has been very good." Trump added that it "takes two to tango" to resolve the conflict in Yemen between Iranian-backed insurgents and Saudi-backed forces, stating "I want Saudi to stop, but I want Iran to stop also." 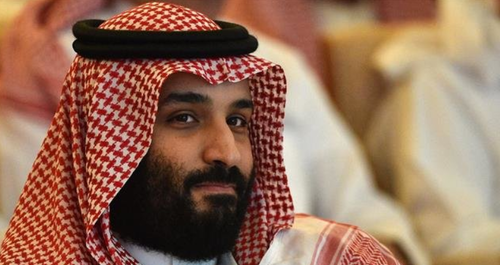 And with Trump, arguably MbS' biggest ally in the west, under growing pressure to take retaliate against the young Saudi king-in-waiting, the crown prince's executive decision making may soon be severely curbed. Needless to say, MBS has a tall task ahead of him in trying to maintain power, keep Putin and Trump as allies, and juggle the entire oil market in the process.